Top Photo from left Olusola Iginla – Charge D’Affaires Nigeria Embassy in Ireland, Amaka Okonkwo – founder eDundalk, Claire Ryan – St Louis Convent, Clr Maria Doyle – Chair Dundalk Municipal District Committee, Michael Gaynor – Dundalk Chamber of Commerce, and Ashimedua Okonkwo – Principal Solicitor at Cyril Solicitors & Co. The Talk Show was initiated in March 2015 by Amaka as one of eDundalk platforms to raise awareness of unemployment issues faced by migrants in lreland . It is also used to inspire, encourage and empower the target group and bring communities together. In the photo are Business Brunch presenters Stephen Murphy, Cathal Cassidy and Eamon O’Reilly. Also part of the team were Mona Daly, presenter, Aidan Noone producer and Alan Byrne, sound engineer. 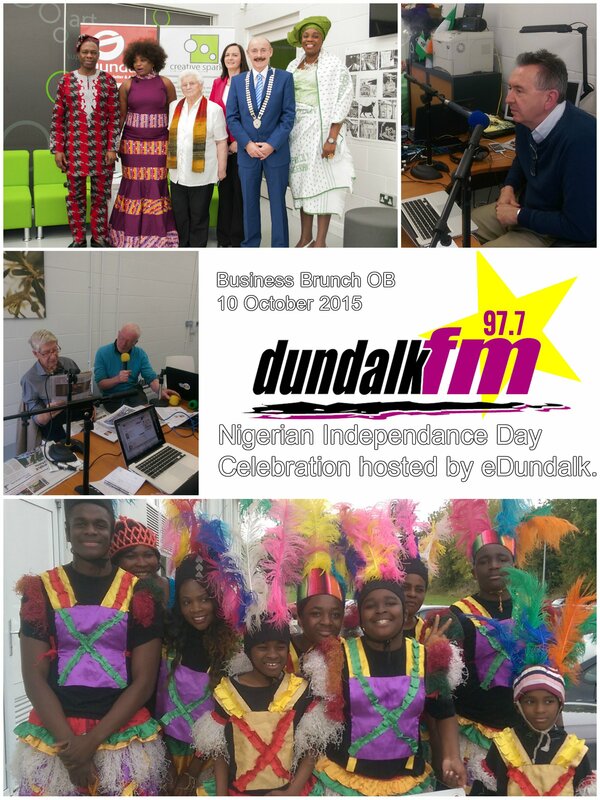 Creative Spark, Dundalk October 10 2015. We are currently testing our new frequency 97.7fm and would appreciate if you would send us a coverage report to 087 09 09 791. So far, with our new 97.7fm frequency we are getting reports of stronger signals in the Knockbridge, Castlebellingham and Ravensdale areas. We will keep you updated with more information. You will shortly receive a postcard through your letterbox to remind you that from Sunday 1st November Dundalk fm will not be on 100fm anymore. So if you haven’t done so already please retune your radios to 97.7fm. 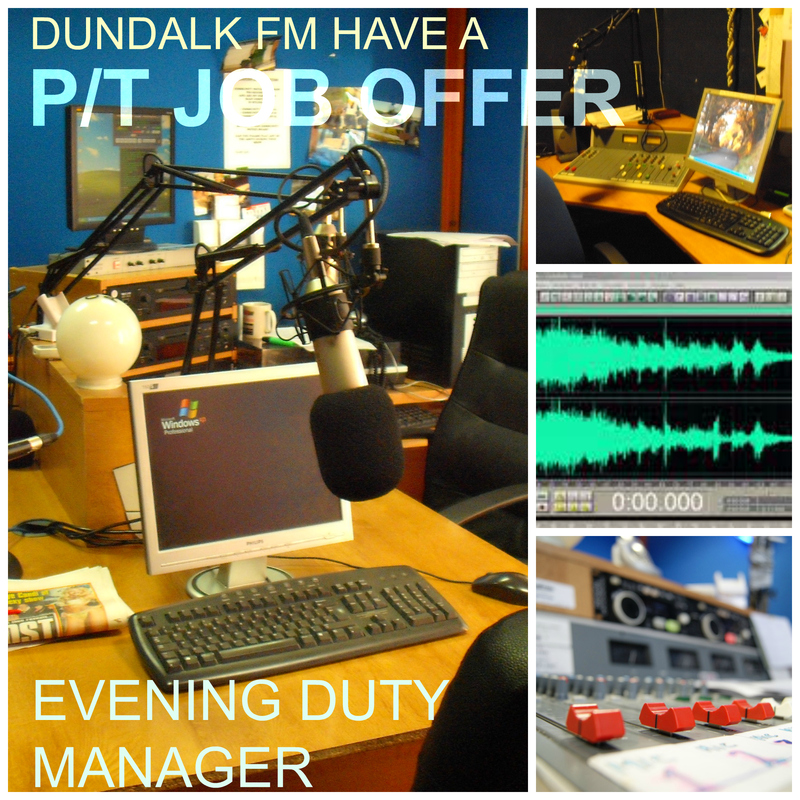 Dundalk FM have a vacancy for an Evening Duty Manager (Community Employment 19 1/2 hrs per week). Previous media/music /IT experience an advantage. Editing audio and archiving programmes. Recording programmes, promos and ads. Training presenters and community groups. Applicants should consult their local Intreo Office to ensure they qualify for a CE placement. Closing Date November 6th 2015. Apply to Central CE, Quayside Business Park, Mill Street, Dundalk. Tel (042) 932 8316.